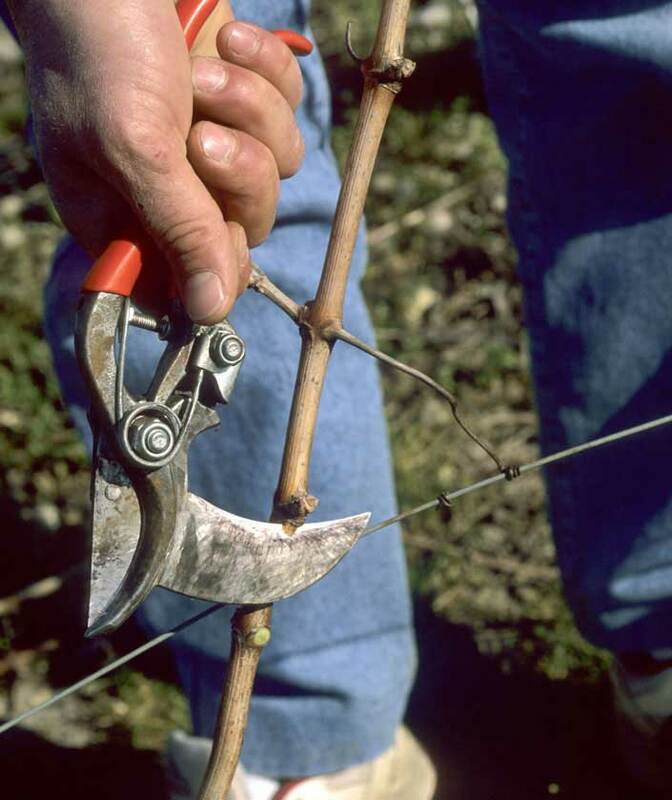 – pruning : Vines are creeping plants, their wood can be very long and could feasibly creep along the ground if they were not pruned or attached to wire. 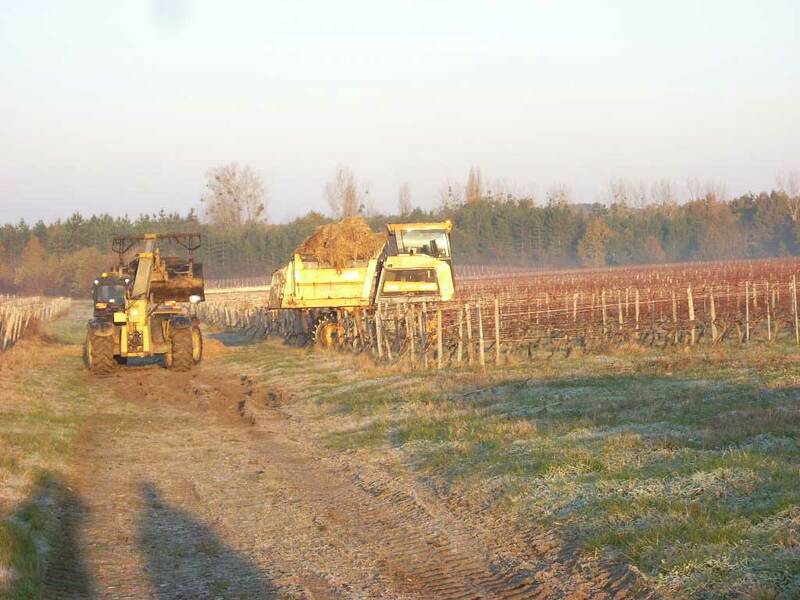 The potential of the future harvest is linked to the number of buds left per cane. 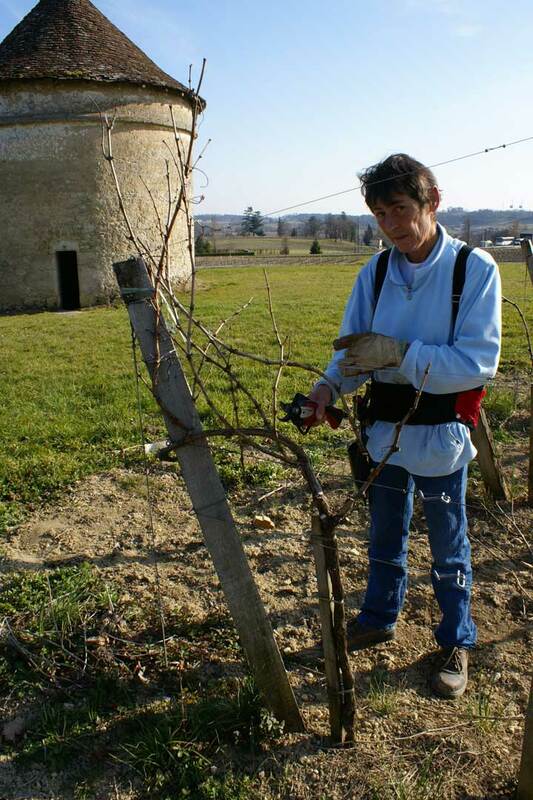 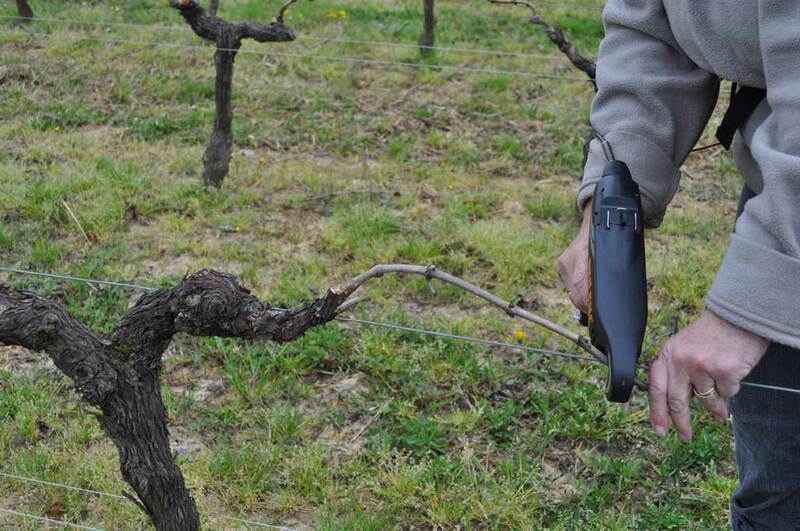 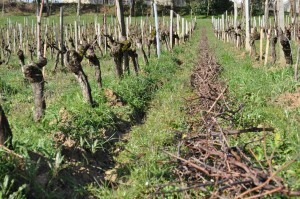 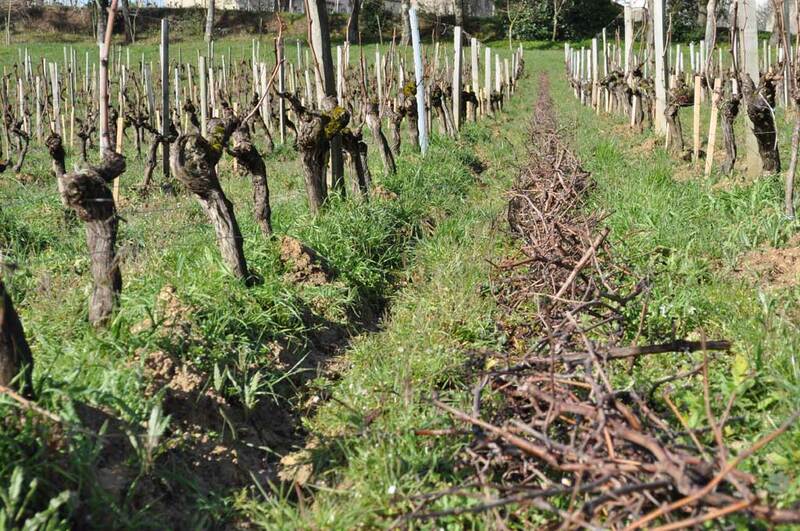 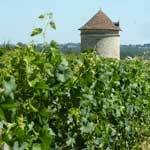 Depending on the plot, we prune in double Guyot or Cordon. 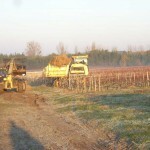 – felling the wood : grinded wood on the spot to restitute organic matter to the soil. 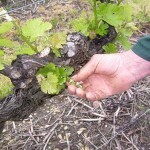 – binding and folding to master and control the direction of the plants. 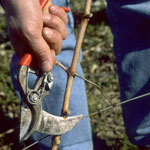 – trellis maintenance (stakes, wire…). 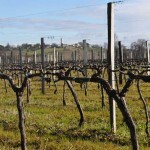 Trellising permits us to grow the vine in a vertical manner so that it can capture a maximum amount of sunlight in order to facilitate the photosynthesis. 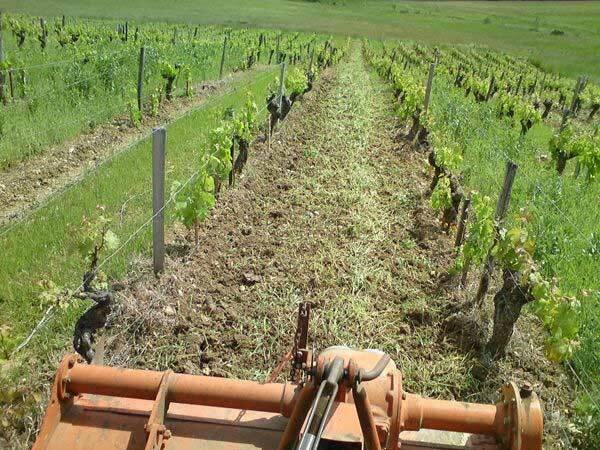 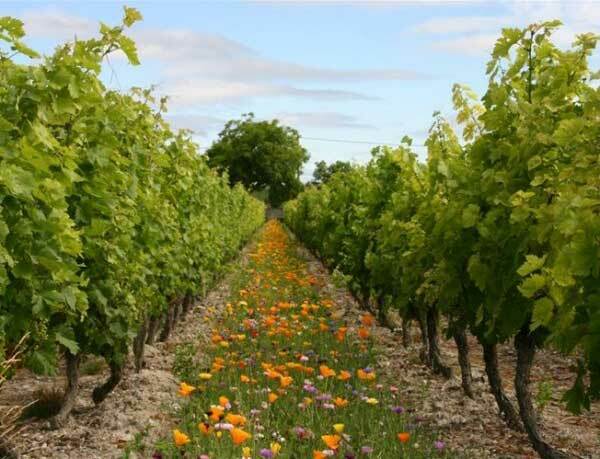 – by seeding and burying « green » – fertilizers (leguminous, grains, crucifers) that bring to the vine the nitrogen necessary for its photosynthesis. 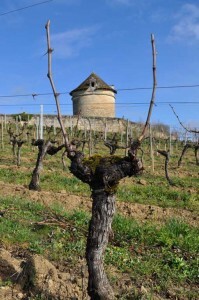 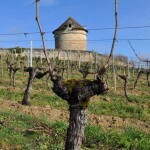 – suckering : removes from the vines (below the plant stock and in the plant-heads) the young, un-needed growths for a better ventilation (diminishes the risk of illness) and for the nourishment of the grapes. 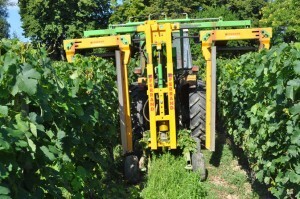 When possible, for the plant, we use a lashing-based suckering machine. 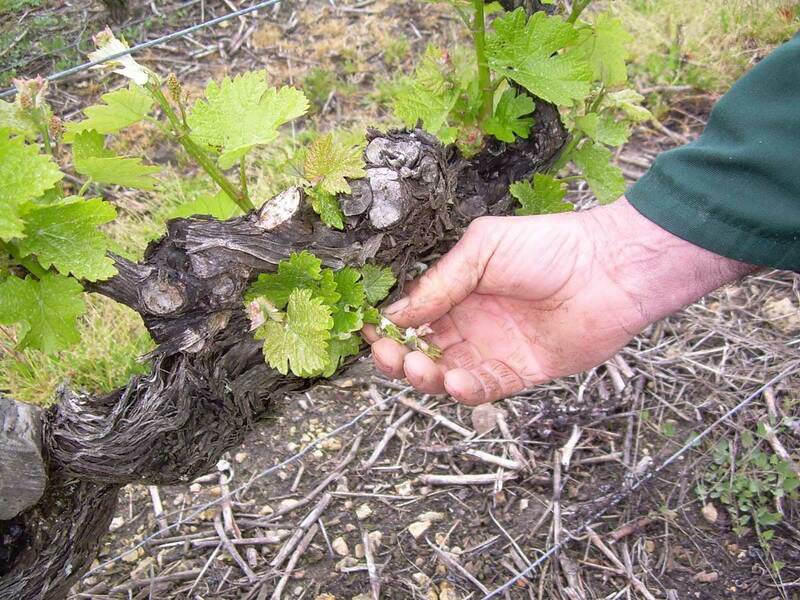 – de-budding : the buds are found at the base of the cane (base-bud) and are raised to permit a greater spreading out of the bunches to limit the risk of rot and to increase the sugar concentration. 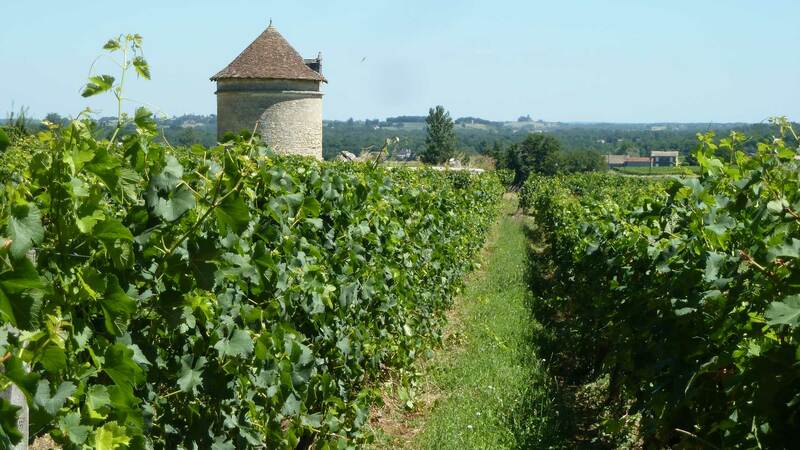 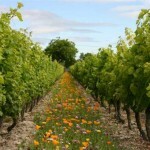 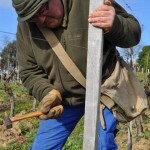 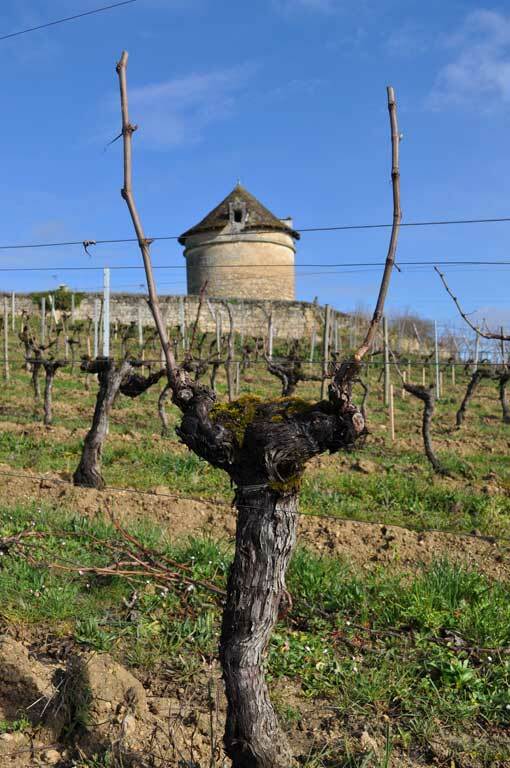 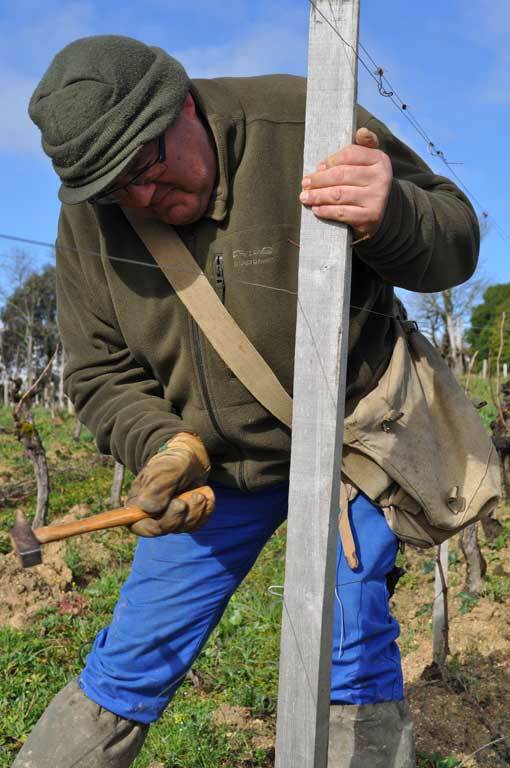 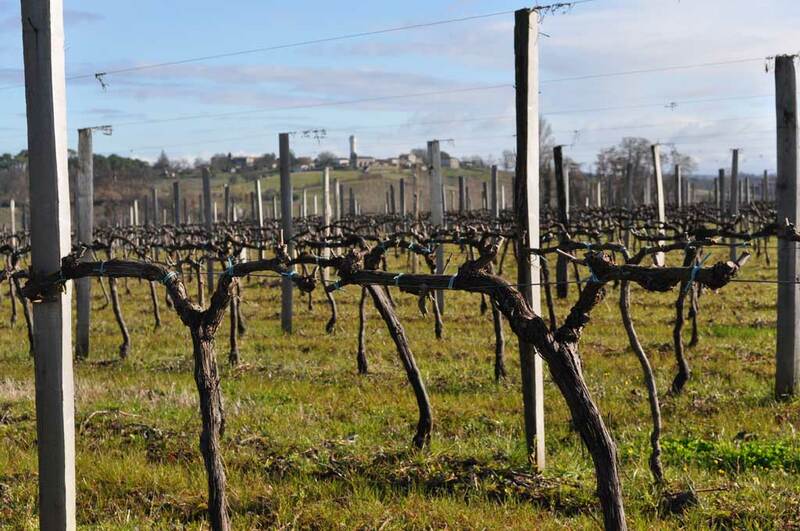 – lifting and second-lifting to avoid that the vine grows in a disorganized manner and so that the canes and leaves receive a maximum amount of sunlight. 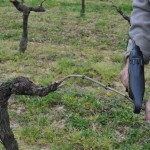 – trimming and topping allows for the management of the growth of the vine, to define the canopy surface necessary for an optimization of the photosynthesis. 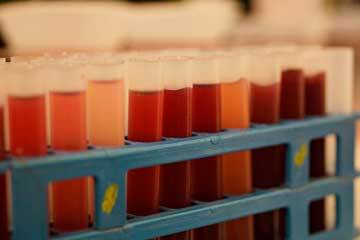 – the control of illnesses (mildiew, oïdium, botrytis) by means of general disease prevention, a precise tracking of weather reports. 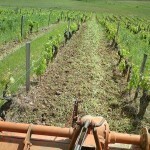 The result: 50% reduction of chemical product use. 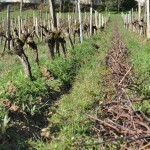 – leaf thinning : allows for a better ventilation of the bunches so as to preserve their healthy state. 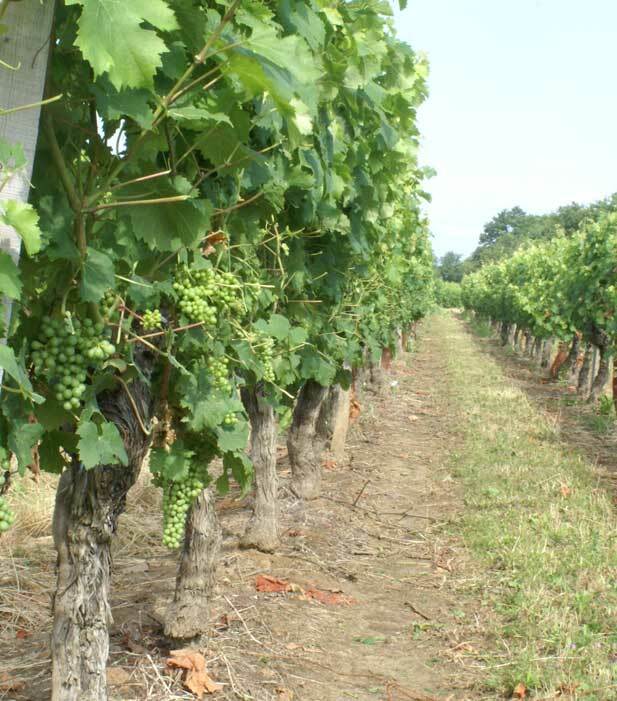 The bunches will be better exposed to the sunlight and will more effectively synthesize their colour (but beware of sunburn and berry burns if the leaf thinning is to ardent!). 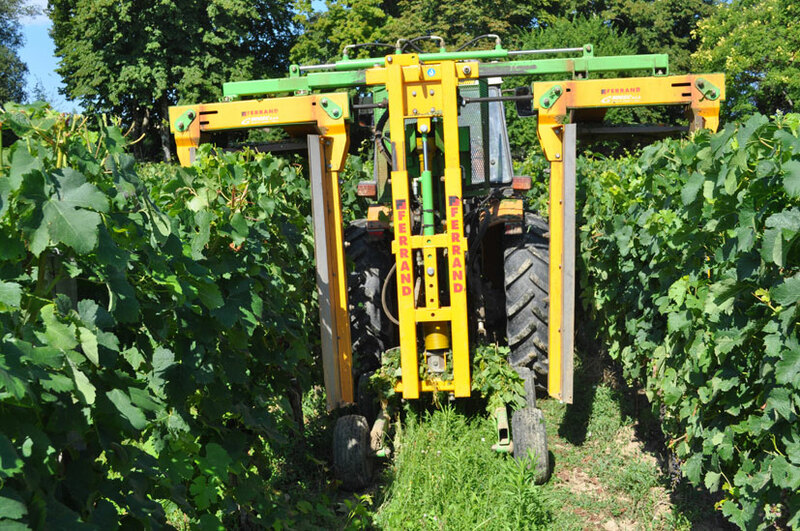 We use a machine where the rollers engage the leaves; with this type of system we obtain a quality de-leafing job, just as though de-leafing was undertaken by hand. 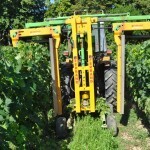 – bunch distribution : removal of bunches (green harvesting) for a better harvest maturity. 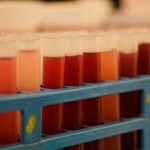 – monitoring of the maturity by laboratory analyses and berry tasting. 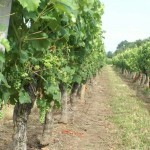 Goal: to obtain grapes with a good organoleptic balance (sugar-acidity-aroma) to facilitate the vinification.